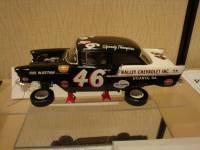 Randy Ayers Nascar Modeling Forums :: View topic - Gentlemen... start your Monte's! Posted: Sat Feb 09, 2019 11:38 pm Post subject: Gentlemen... start your Monte's! After a lot of staring at photos and the Revell alongside the Salvinos kit I believe I've formed both a theory and a plan. I've noticed elements from nearly every photo I've looked at in the Salvinos car. Whether a conscious effort or by mistake, I believe this is the downfall of the kit's body. One faction, the passive modelers, are fine with whatever gets them into the ball park. And that's okay for them, but as long as they are passive and accepting, we'll keep getting kits that are trying too hard in the wrong areas. The other faction, known as the "rivet counters" (hi guys ) are happy with reasonable representation, but get strung tighter than a fiddle over a well executed 24th scale alternator. In both camps there are those with the time and talent to turn this seeming turkey, into a bald Eagle, with little more than a pencil, some masking tape and an emery board or two. There might be a couple spots this could benefit from some strip plastic and we'll get to those. For now let's get a good look at what we're up against and pick a starting point, K? Here I marked two character lines. The beltline and the skirt line. This was a surprise to be sure, but the beltline actually travels upward toward the rear a full inch from the front. The skirt line does the same only a tad more dramatically. 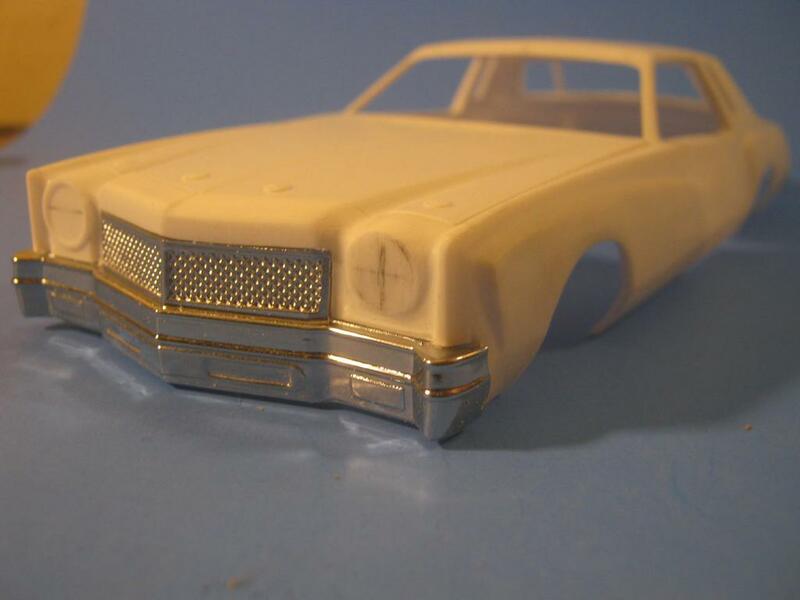 I don't know that much about Monte Carlo's, but this flies in the face of automotive aesthetic. I have no idea where the center ridge line comes from, but the roof tapering outward is an optical delusion... almost. 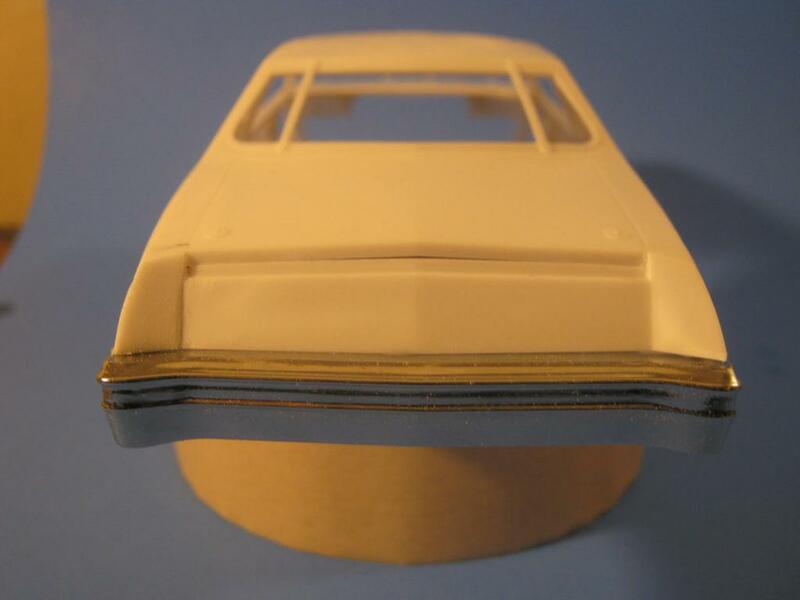 The deck lid of the Revell is the same size as the SG Monte, prior to adding the tail light buckets and the hood has a little more peak than the Revell. Here we are with the doors lined up. The Revell unit is far from perfect, but it is straight and symmetrical. Photos and the Revell will be a help with this project. I'm going to start this tomorrow with a quick easy fix for those character lines. Thank you for doing this, Adam. This is the kind of feature I hoped all the discussion might spawn, and it's very helpful for those of us who may decide to make the most of what we have. I like what you’re doing. The side by side comparison is great! No sir. If you were reading the text instead of just looking at the pictures you'd see, I called the Revell unit "far from perfect". Yeah I read that, just wondering are you wanting the Salvino to look more like the Revell or the Revell to look more like the Salvino. Adam is showing the two Monte Carlo kits and shot comings of both. I have designed kits for manufactures. 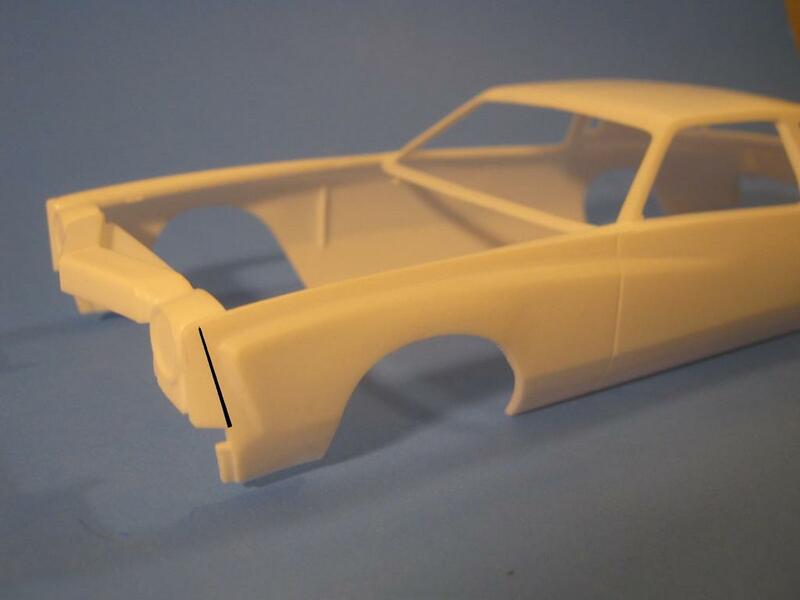 I have designed, manufactured and sold my own line of model car kits. I am not uneducated on design work. The Salvino's body is not junk. But it has issues. The headlight doors are going to be hard to fix. The tail light covers are just wrong. Good news it LOOKS easy to fix. 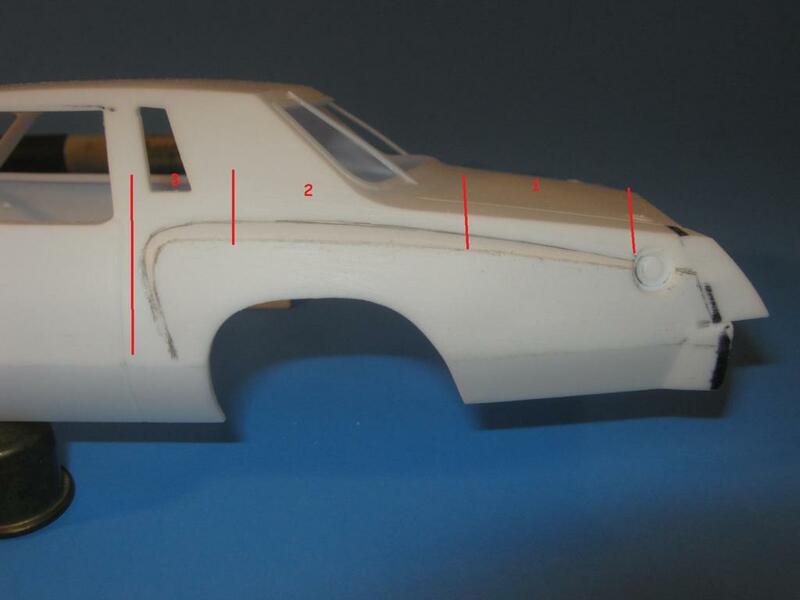 The issues the Salvino's body has were not because it was impossible to make it correct in scale.....making these areas correctly would cost the same as it was tooled. So now it is up to those that do not like the Salvino's body, as is, to formulate ways to fix it with the least amount of work possible. At $40 I'd expect only clean up and slight adjustments.....not major reworking or the need of resin parts to make it right. I hope we as a group can create simple fixes that work. 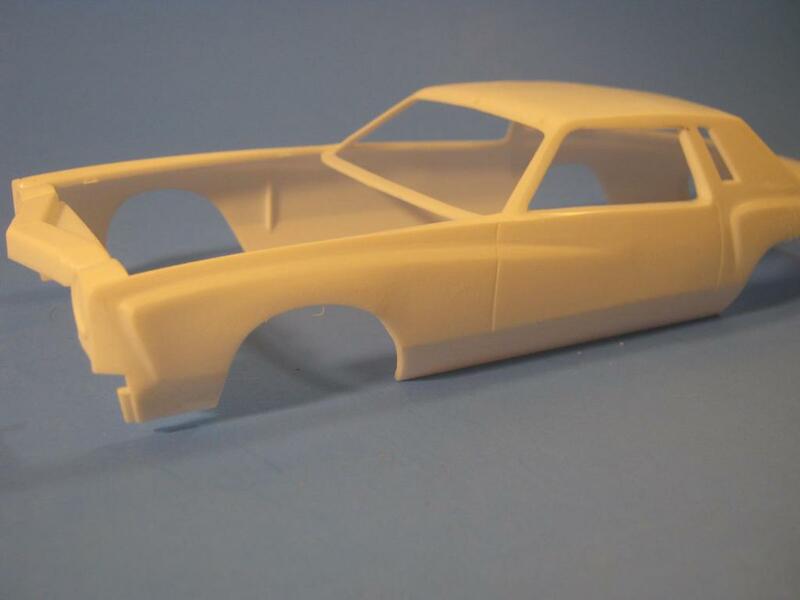 Just a question and please don't get all bent out of shape but has there ever been a model that is an exact replica of a real race car I guess what I am saying is perfect in every way. 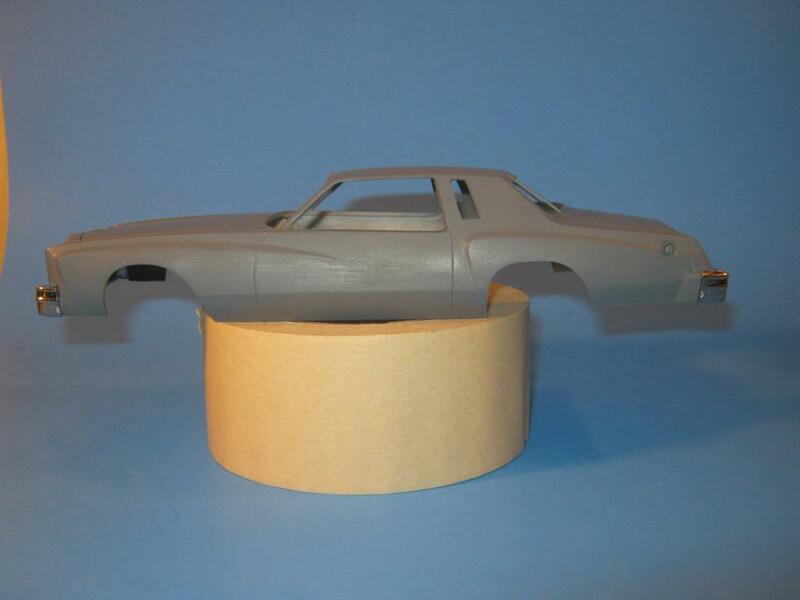 Let's for an example look at a stock car kit from another manufacture. 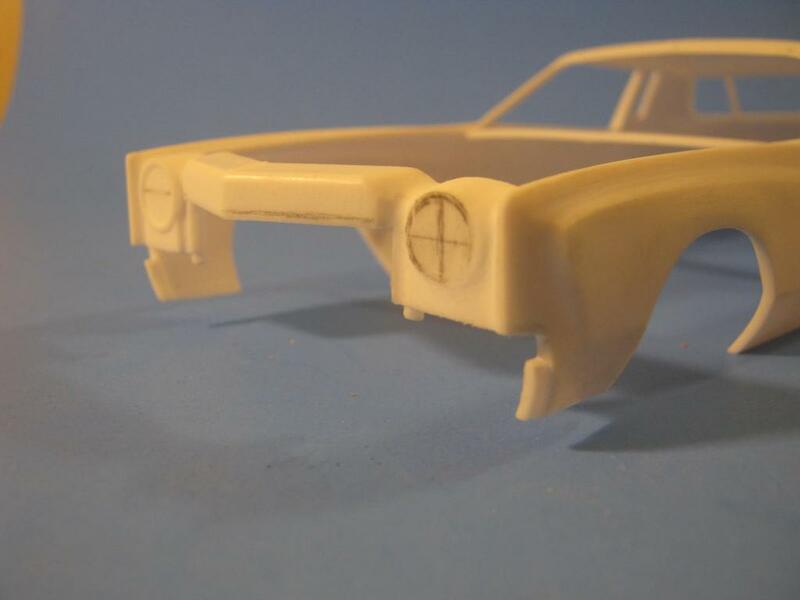 Monogram's 1983 Buick Regal Gran National kit. This kit was designed on paper and carved wooden patterns 37 years ago. The body is SPOT ON and needs only about 2 minutes of seam clean up and it's ready. Problems: no rear package shelf. 3 minutes and some sheet stock fixed. Exhaust headers are a rare type and the fit is HORRIBLE and not an easy fix. I cut off the cross over pipes and keep going...ONE minute fix. 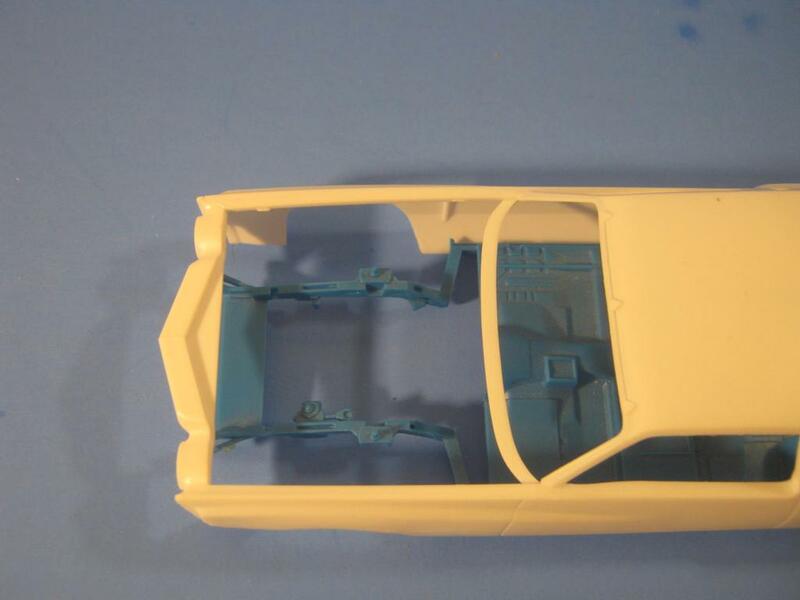 The kit is missing the front springs using round posts in place....but can't be seen once assembled. Not an issue for ME. This kit retailed for $5.50 in 1983 OR $13.73 in today's money per the US Govt Inflation calculator. Let's look at another kit. Tamiya Alfa Romeo DTM road race car. I have built this kit twice. It makes the Monogram Buick look like a junker!! No body seams to clean. No fit issues. Nothing shaped wrong or in need of correction. Builds easy....looks just like the real thing. At $38 it is a marvel of kit engineering. In a class by itself. Perfect?? I am sure if I look long enough I can find a issue. But there is so much good....I can't see it. 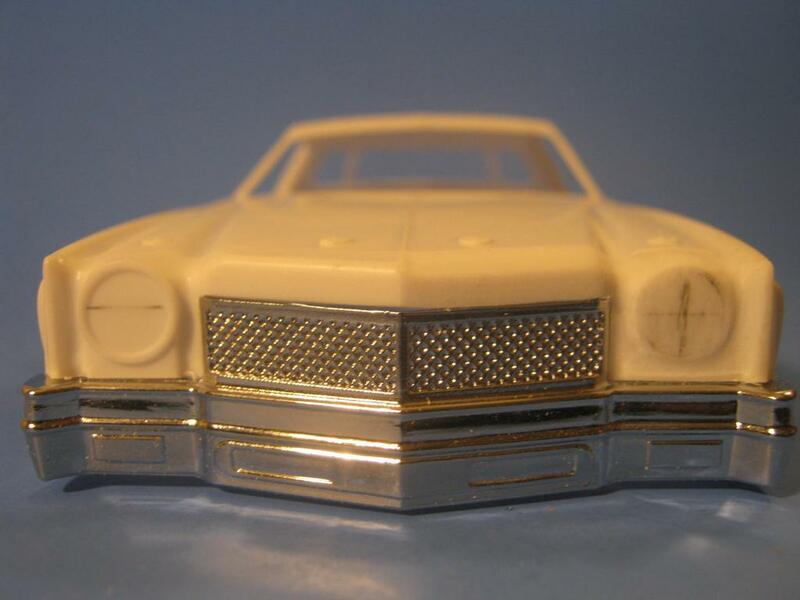 I think what has caused all the discussion over the Salvino's Monte Carlo is many of us WANTED this kit for 25 years.....SO many famous car we can build. I myself saw buying 12 to 24 of them. Now we see how much work the kit requires to bring it up to OUR standards. We are in a sort of model builders PANIC over our dream model. The industry calls us the Lunatic Fringe but also admit we are the same group that can make or break a kit. When we like a kit....we buy bunches of them.....Causal modelers and grandma's do not make a kit a hit....we do. No, no there hasn't but, excluding the AMT early eighties snap together kits, most of them get into the ball park. This Monte lands in several ball parks, each one playing a different game. My intent here, as Dave said above, is to show the shortcomings of the body and present easy fixes to get a better looking car. 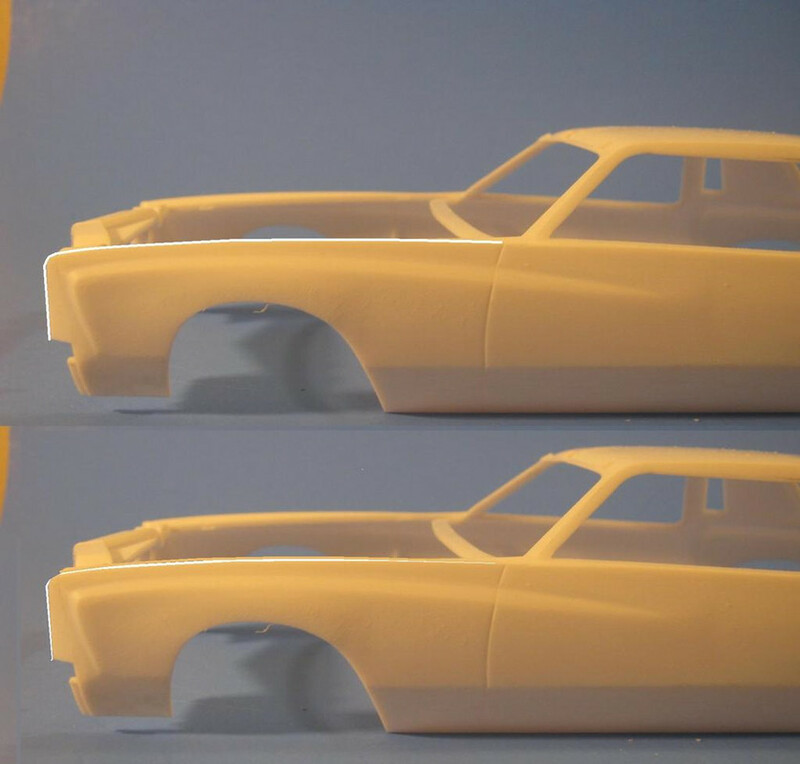 I should not have to put up a trigger warning but here goes: WARNING, this tutorial contains scenes of a bodywork nature. Some scenes are graphic and may be too intense for some viewers. Bottom line though, this thread is NOT about bashing either car. It is not about hating on Salvinos and I would politely aske everyone to be kind in that respect. I also ask that anyone doing their own work that can post pics, please do so. Many optional techniques are always better. What works for me, might not work for any of you or it might work for most. Either way, chime in if you wish. I have some test shots to cast and will be back later tonight with the first set of adjustments I am making. Let's also look at this discussion on the Salvino's Monte Carlo as a positive step and how it MAY help the next offering ?!?! IF all this back and forth leads to a FANTASTIC Pontiac GP 2+2 of 1986 maybe it's worth it all. I have a bonus fix for you with this first step, because I'm stupid. This first shot shows where the beltline and skirt line are as well as should be. The beltline isn't that bad and honestly, a dozen strokes or less and it was moved easily in place. These first couple fixes are easy for anyone, even the passive modeler looking to expand his skills. 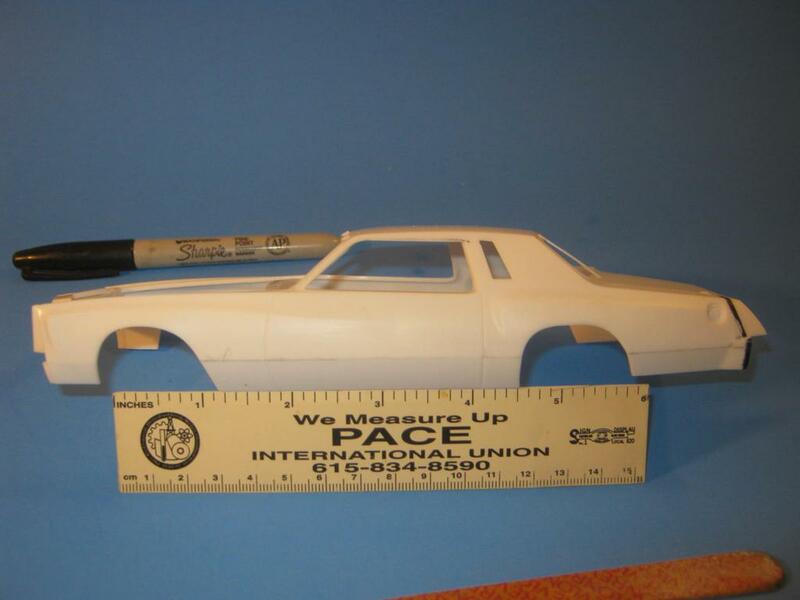 Lightly surface sand the side of the car so the pencil will leave a mark. Measure one mm down from the beltline at the rear wheel well. Start your tape at the belt line up front and bring it to your mark in the rear. Your average emery board acts as a long board. Use this angle to get all the way to the wheel well without disturbing the panel arch. We'll do the same in the opposite direction on the rear of the panel. The rear panel should start at the wheel well, one mm higher than the beltline in front of the wheel and continue to the bumper skirt about 3mm lower than the top edge of the skirt. I say "about" because there will be differing opinions on the proper angle for this, but my photos show the skirt line aligns with the trim line of the bumper. It always amazes me how, one little millimeter can throw the look off so drastically and how such a little change makes a huge difference.
) , Here's a short cut. P.S. I just realized now, how ironic my slogan is. P.P.S. I say to sand the area of the panel down at the rear instead of up at the front (for an even 12 inches) because the work is much easier sanding the rear portion down. You're welcome Jodie. I'm hoping nearly everything can be done with simple sanding techniques. Location: Just outside Chicago limits Il. Thank you very much Adam for this tutorial. Anybody else doing one should also make note for the rest of us who will try in future. Many great cars to make even west coast ones. If you bought it a trucker hauled it. A mind is a terrible thing to waste, have you seen mine? No worries. I would like to note, what I'm working up here is the 1974/5 style. 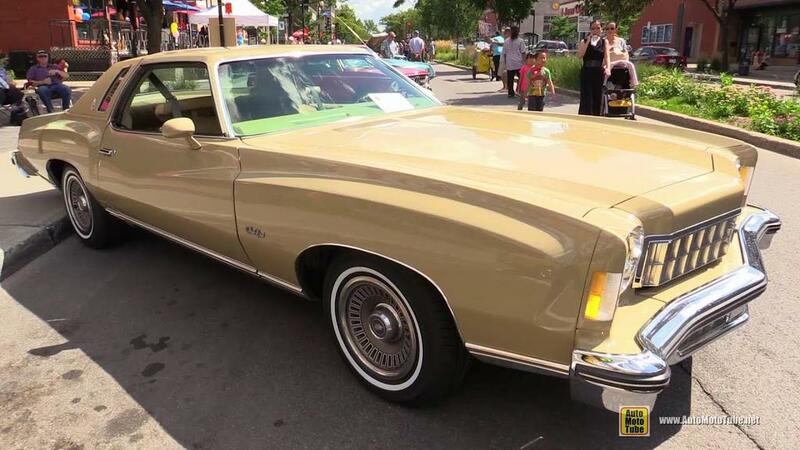 The 1977 style has it's own differences beyond the nose and tail lights. 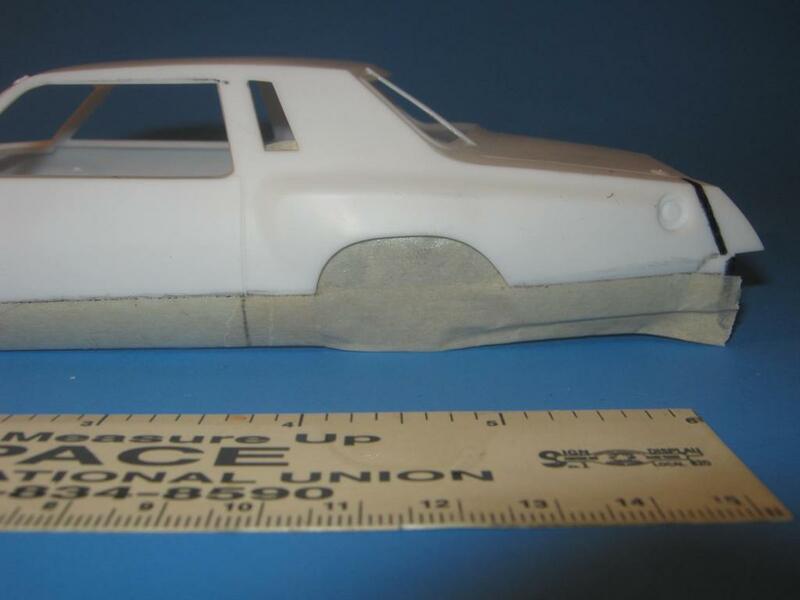 Next I think I'll sort the quarter panel and start working forward to finish out the side, then I'll get to the greenhouse. Allrighty then! Let's get into some more stunt sanding, eh? 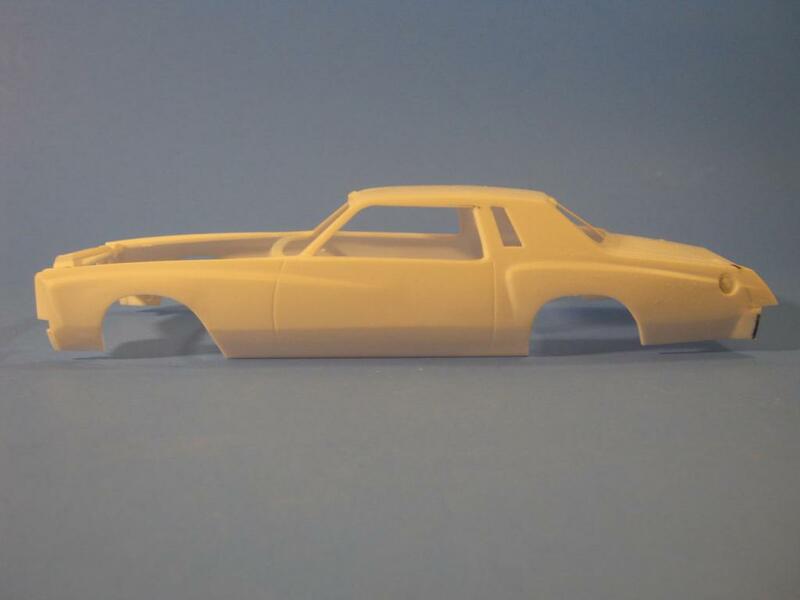 I used the shot in the above post to visualize where I needed to go with this car. In this area? 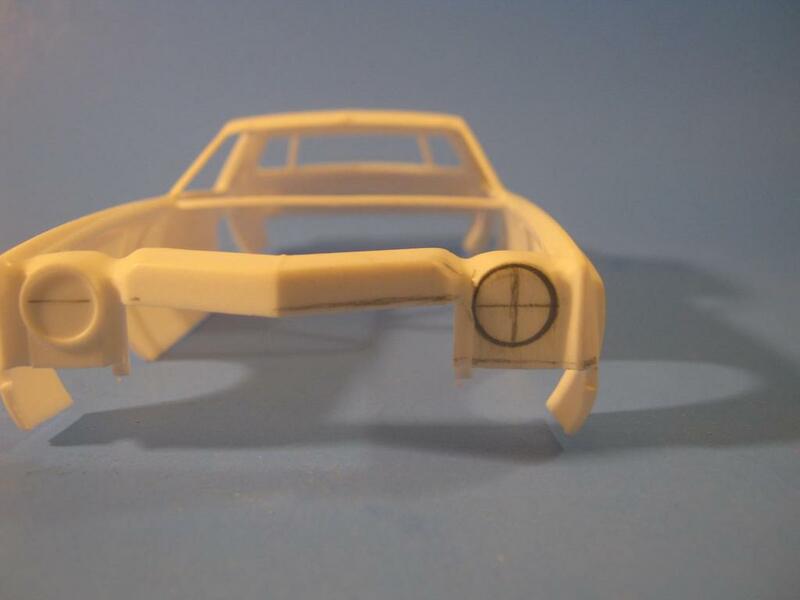 The Revell has it all over this car and it's not perfect either. 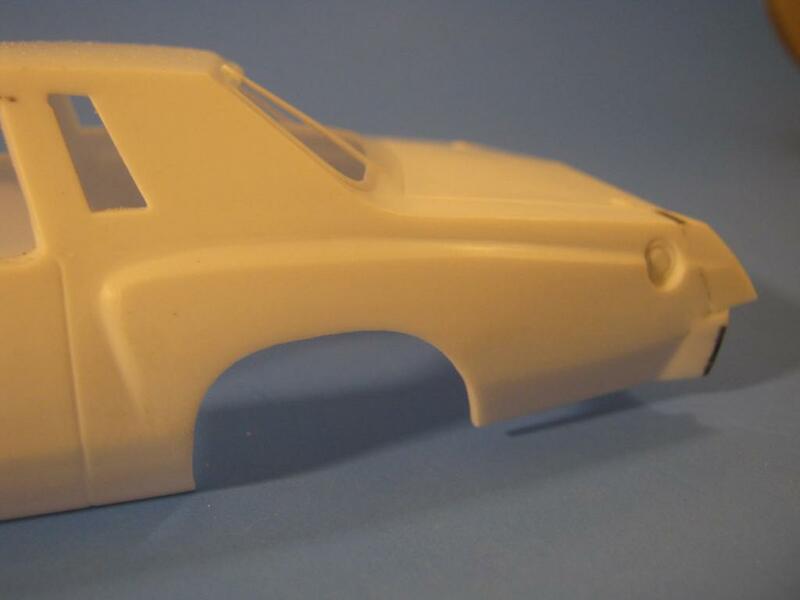 This one however has just enough plastic aboard to do a little reshape like this. You have to divide the panel into these three sections. Because of it's lack of a bow, you'd think the section over the wheel (2), would be impossible to get an arch out of but it isn't. It won't be a great arch, but it will be there. I started in section one. 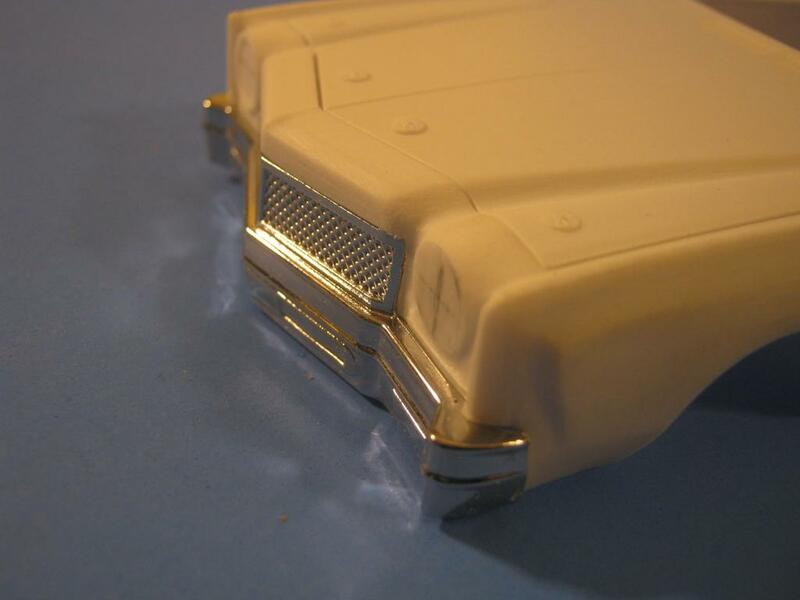 I used my emery board to sand down the narrow panel leading into the gas filler. In fact, mine needs to go lower towards the rear. I allowed the board to dig into the rear of the panel to continue the line. While doing this, I was mindful to NOT sand into the area above the wheel. In front of the wheel, I used the edge of the emery board to redefine the "shoulder" portion of the muscle bulge. This area needs to be a little smaller than I have it as well. SECTION 2! I had to puzzle this a while. About half a minute. There's a raised area on the panel over the wheel well that's kind of... it's lumpy. Again my trusty board was made to level the surface of the panel over the well. This gave me a straight panel and as the surface lowered, the ridge raised! SO! Section 1 and 3, you're lowering the ridge, section two you're raising it. I know this is a little hard to follow, but the point is, it CAN be sanded into shape. The plastic did get a little thin where I sanded the groove in section 1. 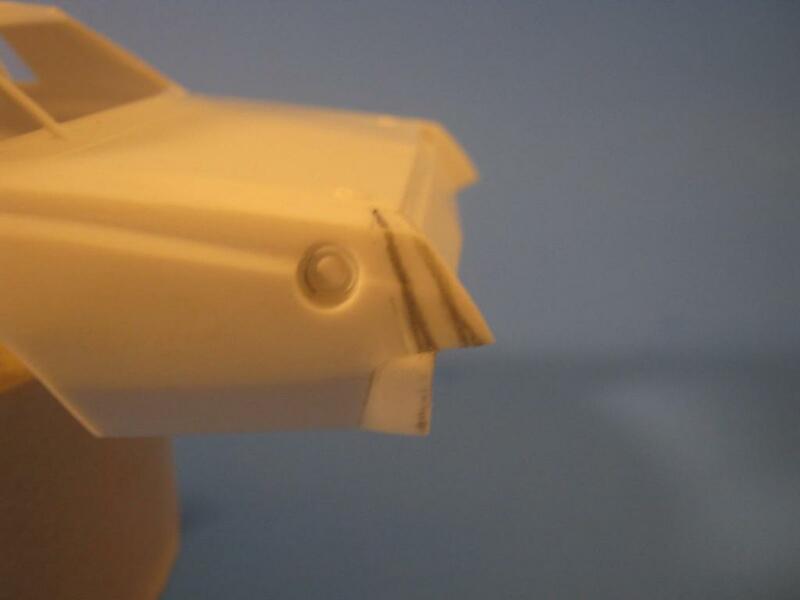 The same technique will be used to rework the front fender and those meat cleaver edges. Using the same technique the front fenders are about as close as they're going to get without some plastic help. How's she lookin so far guys? 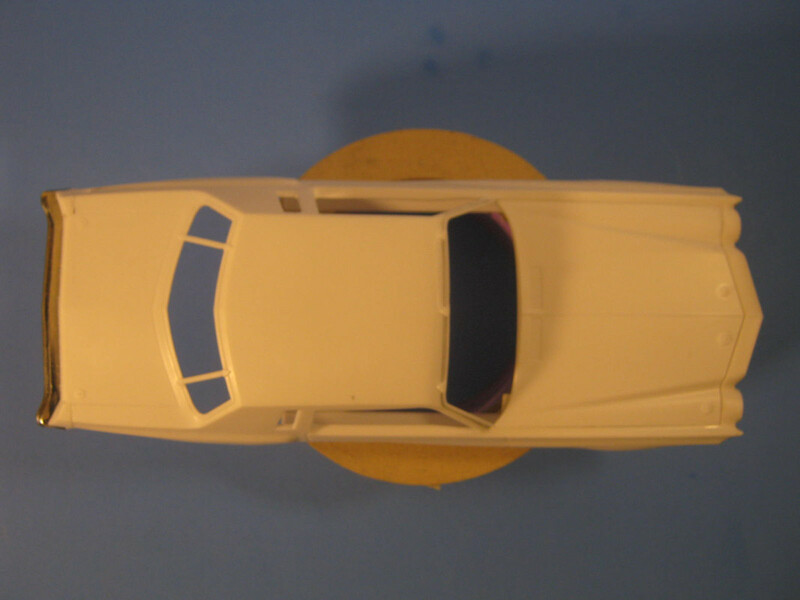 At this point it should be quite obvious, I've successfully replicated most of the lines of the Revell. Really didn't mean to, I was kinda hoping for a little more in the way of shape, but this is still better. Now it's time to consider the fender tops. As you can see here, even with a new swoop to the fender bulge, the top line is still straight as a poke. This would be fine, if the car were a late seventies Thunderbird, Caddy or Lincoln, not for a Monte Carlo. This is a major part of what throws off the look of the car. The fender tops should be nearly as swoopy as the muscle bulges, especially towards the front. The transition into the door also needs a little help. I see two options for re-shaping the fender tops. Sand them to shape just like we've been doing. This will work but may make this area of the fender too small. 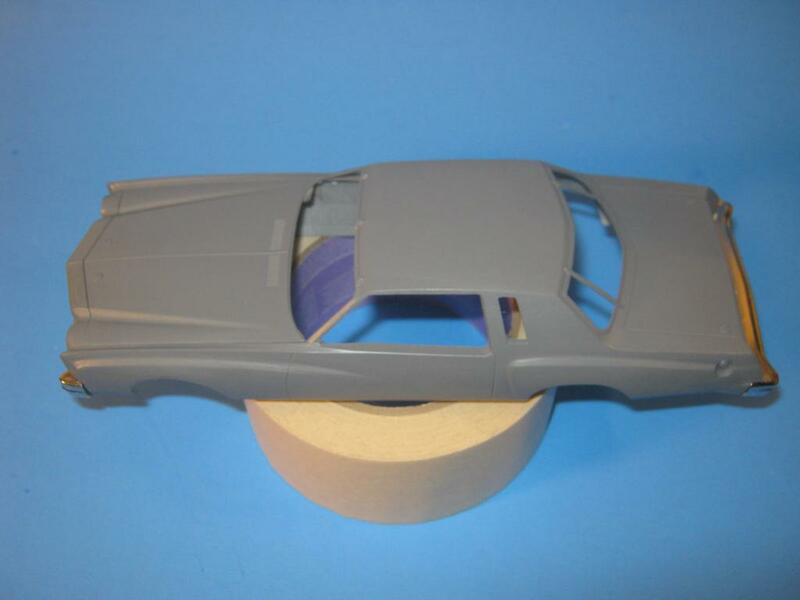 OR, add strip plastic to the fender tops and sand them in to blend. I need to do some staring and mental building. Back in a bit. I'd like to take just a moment for all the children who are watching this. Maybe mum and dad have stepped out, maybe they're in another room, here's a word for you. STOP that! Do you have a plan for the headlight area or am I getting ahead!!! Actually yes. I almost always have a plan, but it's amazing how often they get altered mid stream. as the saying goes: Man makes plans... God laughs. The chassis fits nice side to side, but the length is obviously an issue. 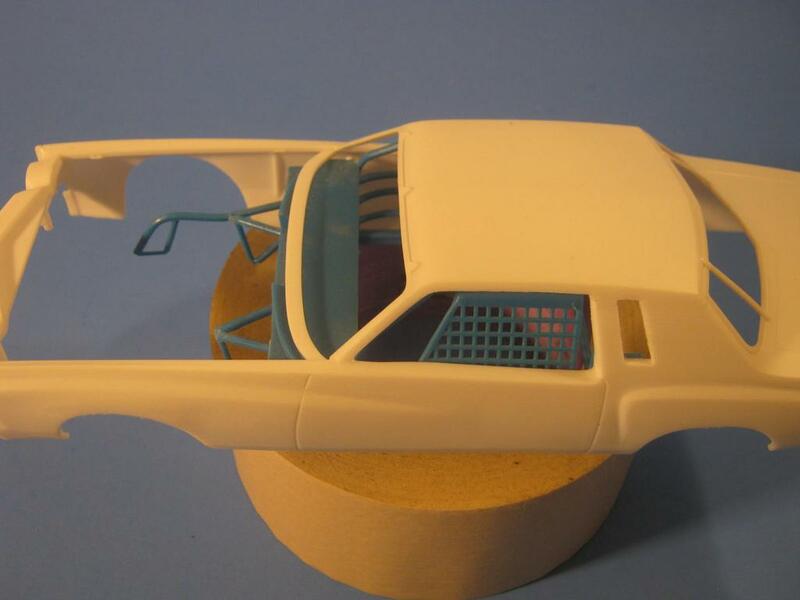 I feel like removal of the rear hood support on the SG Monte would allow the cage to fit nicely. The rest is just stretching the chassis arms and engine hoops. Yup. 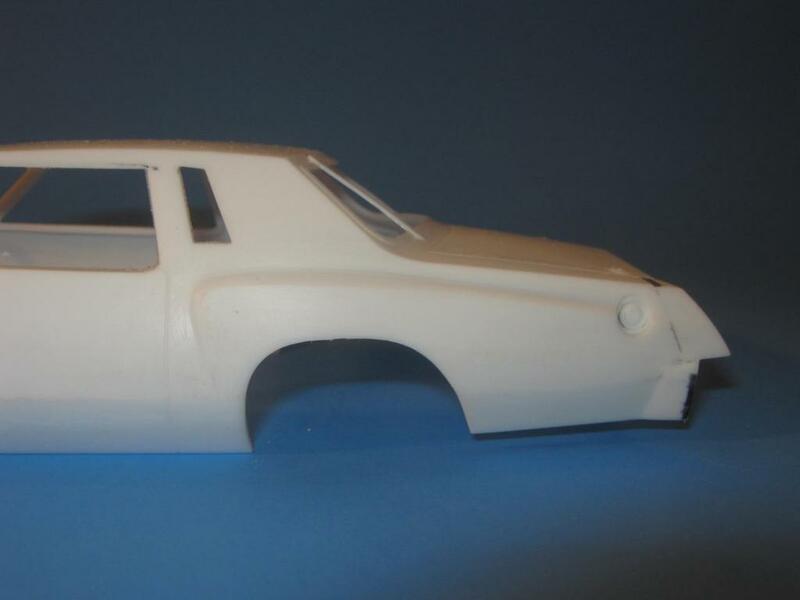 Chassis from the racing Petty's combo kit. Monogram Grand Prix. Thanks for these updates. I will be following this closely. You're welcome. I enjoy helping (could be read as showing off). Right now I'm puzzling through the best way to attack the front end. If I'd left the nose section off I'd be ahead of the game. I know what I want to do it's just how to write it and line up the photos because I want to show three different techniques for one thing but two of them will permanently alter the car. Plus my left eye is attempting to go on vacation. That's always a little annoying. Okay I think I've found a way to do this. Obviously I'm doing the 1975 version of Monte Carlo, and we've reached the fender tips or, as I like to call them, the meat cleavers. This is one of the areas the 1973-5 version, differed from the 1976-7 cars. The fender tips on all the cars I've looked at have a slight, rearward cant. 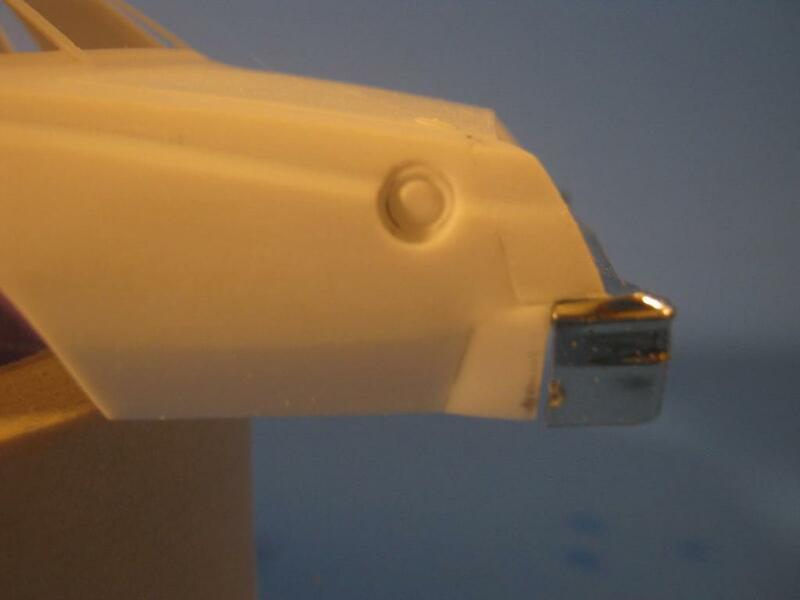 The tops are about an inch further forward than the bottom of the turn signals. Please confirm or debunk this. This is partly by design, as shown in the street car photo, and partly through modification, as shown in the Petty photo. 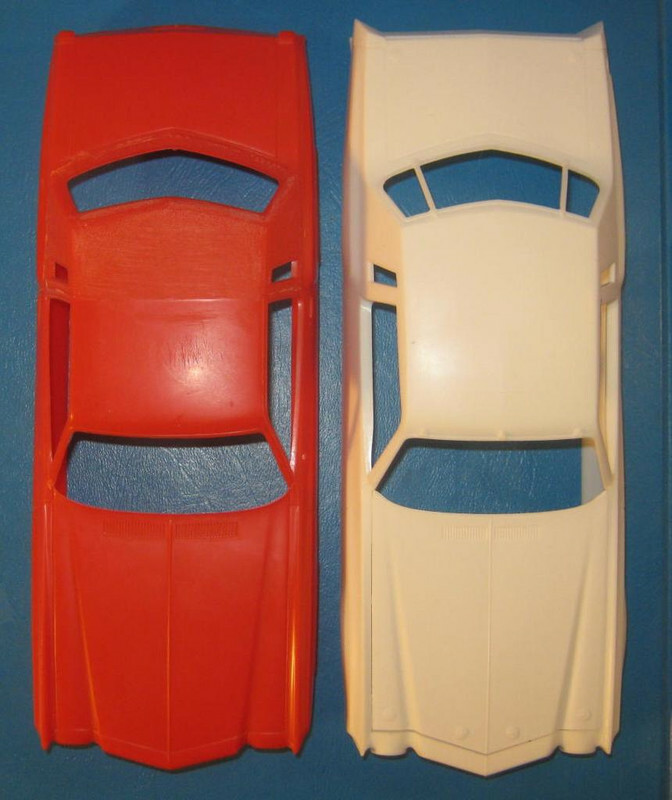 The angle on each car is different, body man to body man, but the basic dimensions stay the same. But this snot here? This is maddening! I told ya it'd get weird quick, well here we go! We've basically been working this car closer to stock trim, so we can give it stocker trim. So for the nose, let's start with a stock angle. Here's the nose with the new corner and angle sanded in. I had to sand mine in because I stupidly attached the nose piece before I was really ready for this. Ahhh… plans. YOU... have options. 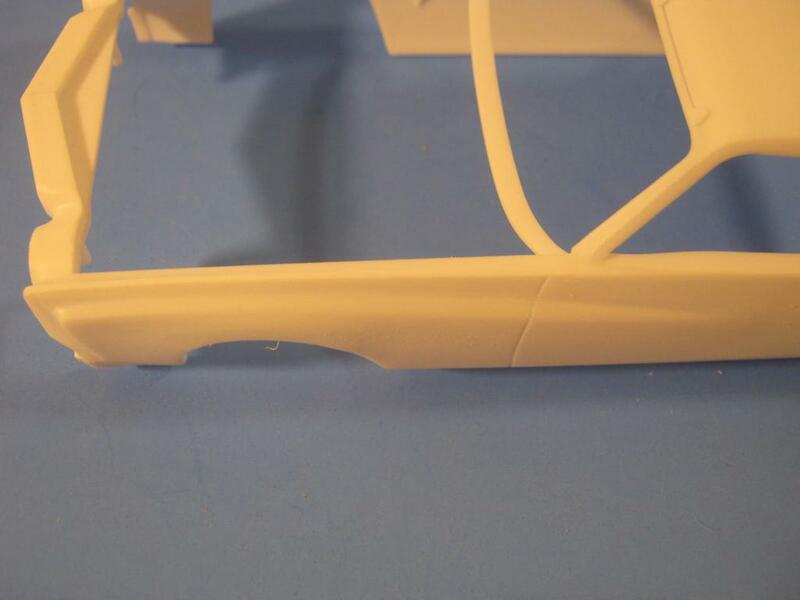 The best option for someone who hasn't glued on the nose, is to take back the mounting points on the fender, at a slight angle. This will tilt the nose forward slightly and depending how you want it, fixes the angle, which is currently non existent. It does not fix the shape of the nose, but we're getting to that soon. Another option is a chopper's specialty, wedging. Or in this case, slotting. 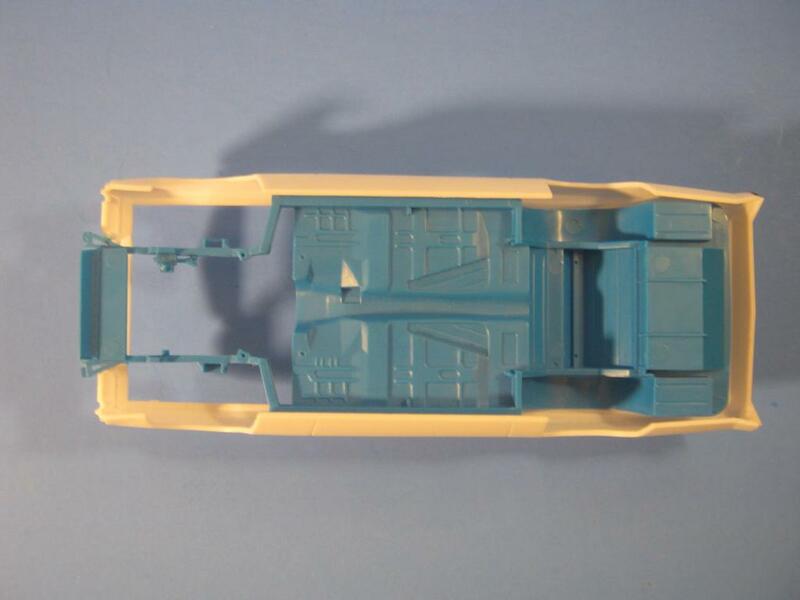 After opening the wheel wells to where you want them, cut a slot at the same spot in each fender. Remember, the width of the slot will dictate how far down the nose dips. Some guys use the hot water and shape it method to do this, I do not. It's too difficult to get a level front end. 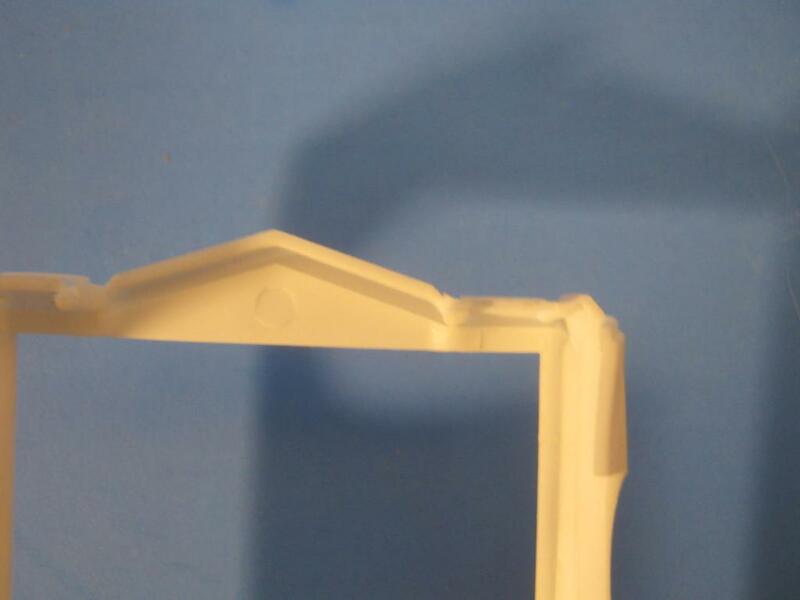 Instead, glue a thin piece of sheet plastic behind the cut on one side only. Set the body on a flat level surface to figure out the angle you want. I use popsicle sticks to keep the nose level and even while I glue the patch to the other side of the slot. 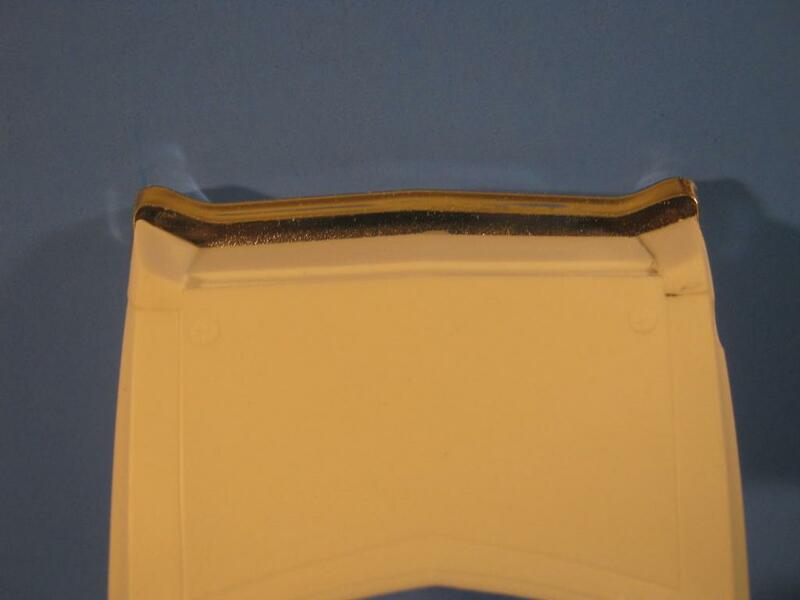 The final method of getting the arch in is strip plastic. Get some evergreen .75mm bar stock. the fender top is .75mm wide. Start on top of the fender at the door gap and go all the way to the bottom of the front like this. Photoshop again. This can then be easily sanded to shape to get the curvature you want and will blend easily like this befor/after shot. As it turns out, each team car is different. (DUH! Right?) So as you work on yours be mindful of details. 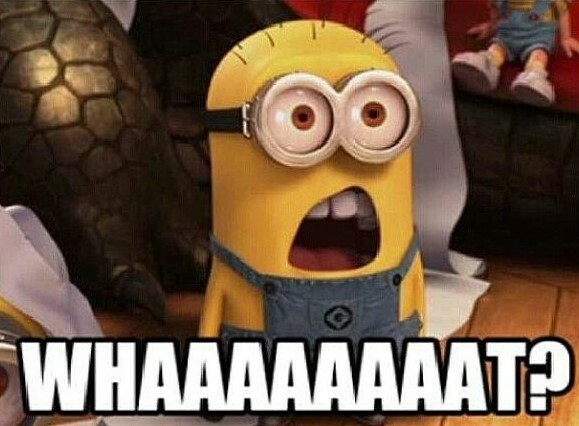 That belt line we started with? Some cars just have a roll, others have it but it's softer than on others. These are some ways to lower the front end but always keep in mind, that slight change in 1/1 is a drastic change in 1/25th. So work slow and lots of test fitting! 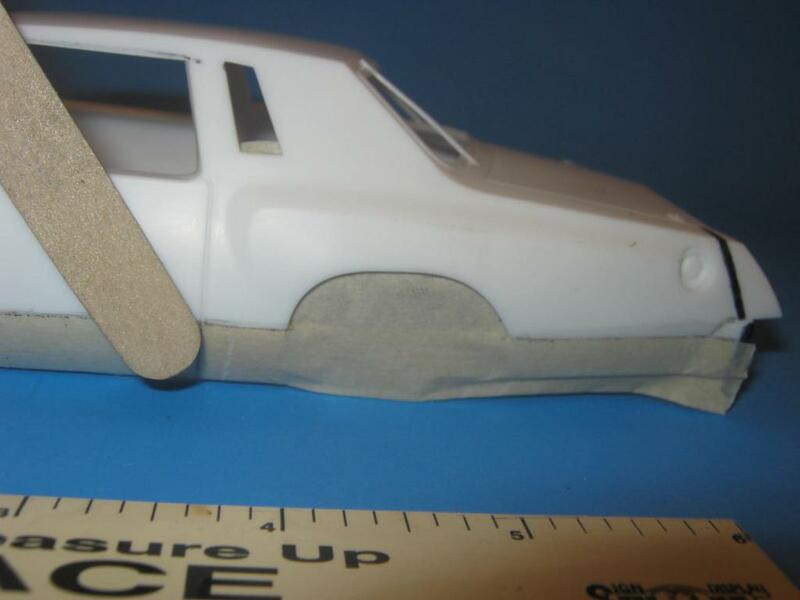 Keep in mind, if you go with sanding down the fender tops or adding plastic to shape them, if you go too low just add another strip and start again. Once you have your angle the way you want it and the bumper set just right, you still have to re shape the nose. 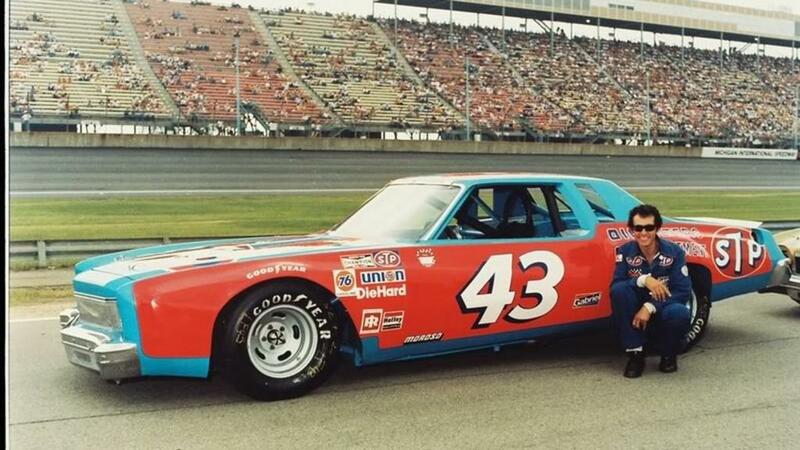 Again, according to all the stock photos I see, the entire nose has the same, leaning forward cant as the fender edges. I will have to work a little harder than you guys because I'm sanding in the angle as well as the shape, so it might be a couple days but, stay tuned anyway. What else are you doing? Time for a face lift! In this first photo, I've sanded down the driver's headlight face to match the angle of the fender edge. 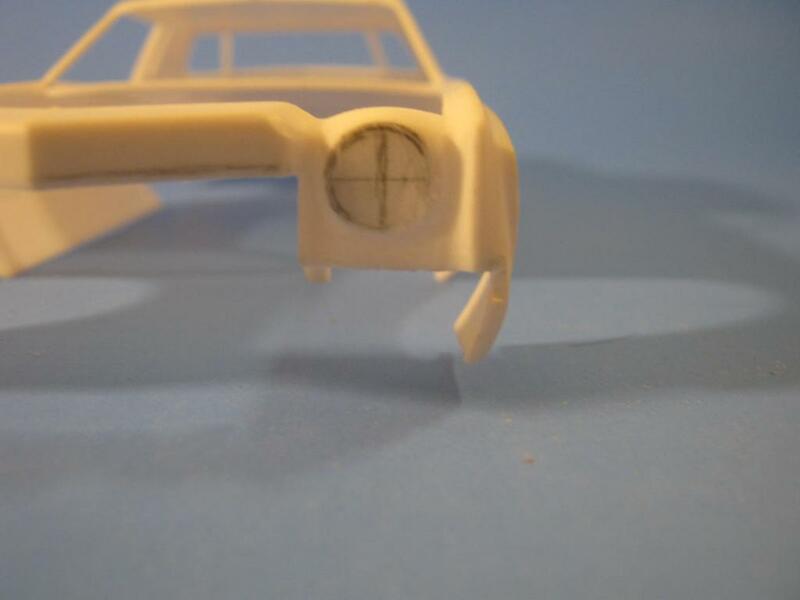 Next I marked a 9mm circle where the 7 inch headlight should be. This is for whittlin room. 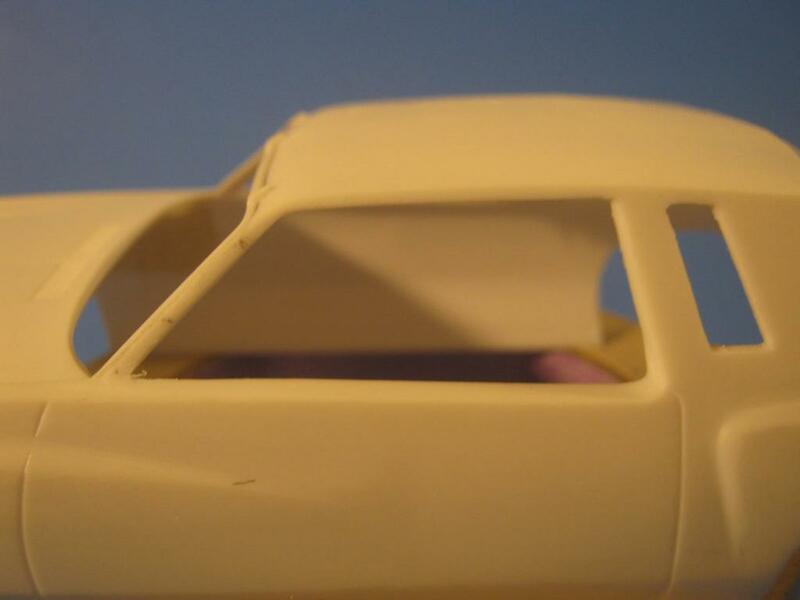 I've also marked 1 millimeter at the bottom of the fender, light and grille panels for removal. This will raise the grille and bumper 1mm and another millimeter under the grille and headlight panel will be covered by the (splash?) panel. Here's the headlight area from all angles after my unprecedented attack. I used sandpaper, I used Dremel, I used a rat tail file and a sanding sponge! And by Dow Jones and ALL his little averages, I ain't above doing it again! Good thing too 'cause it's only half the car! Didn't somebody do a half and half car? Whatever, here's some pics. 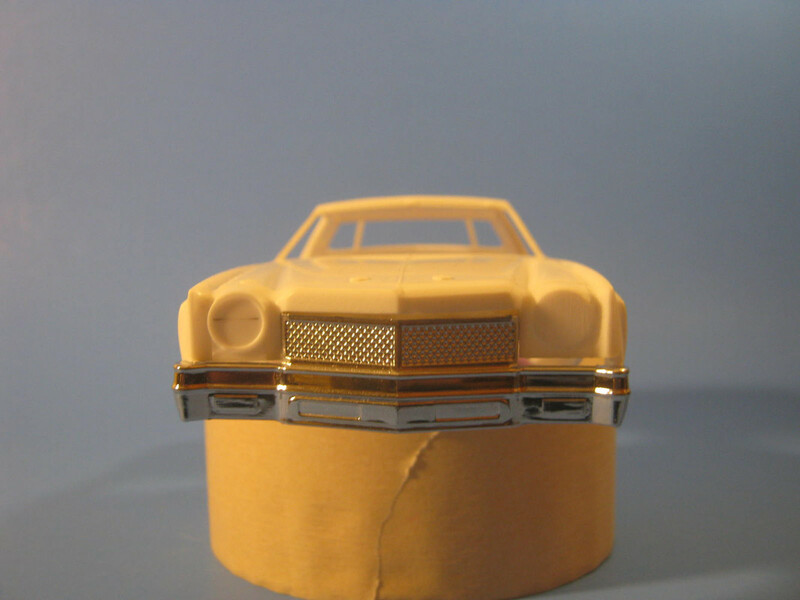 I used a small rat tail file to open the grove on the outside of the headlight so it closer matched the side by the grille. 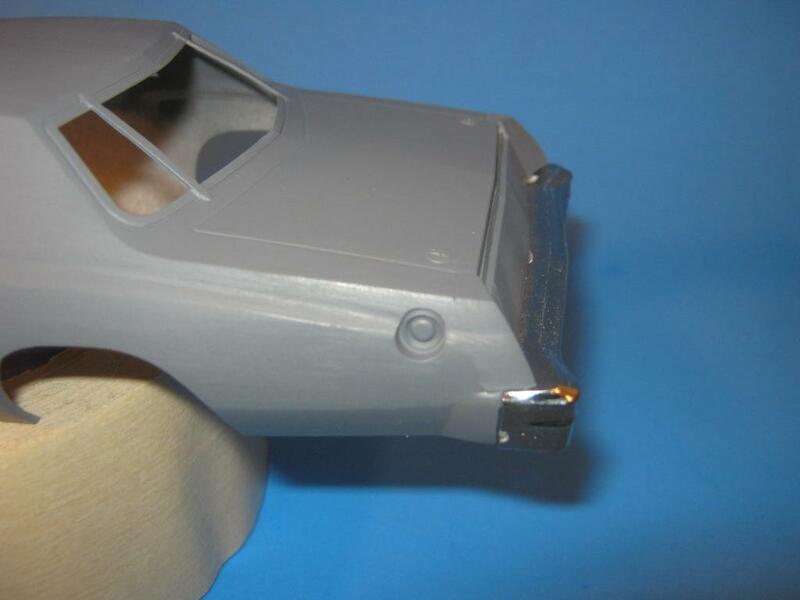 A medium grit sanding sponge (any auto body/paint store) helped shape the top of the headlight area. Under the light I started with my file thinking yeah, just dig it out. DO NOT DO THIS! 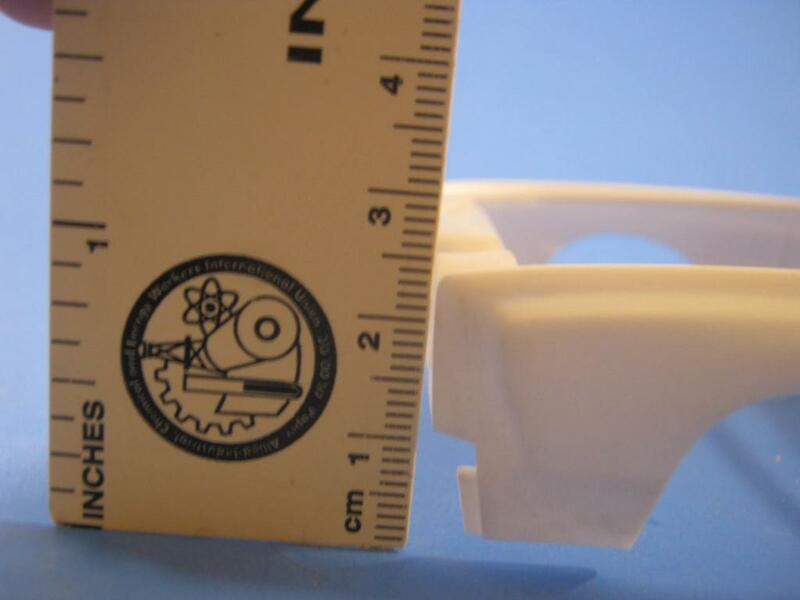 I don't know what grade of styrene this is but it does not scribe well! So I switched to a variable Dremel and a small cutting burr to remove most of the offending plastic and an emery board to smooth. 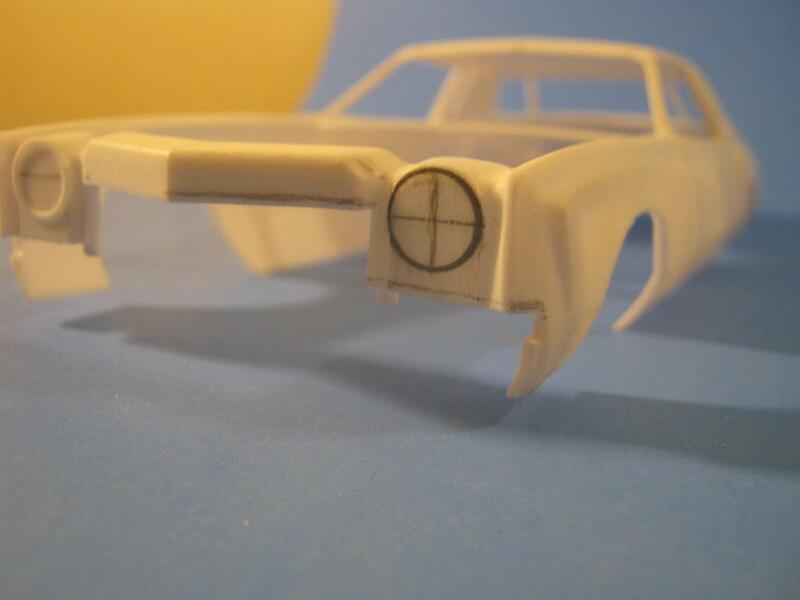 Once the headlight area is 8mm (8 inches diameter) a new ring will be added, likely from the parts box or some styrene tubing. Next chapter :Nose Job OR How'd you like a nice Hawaiian Punch? Final pics for the night. Slowly roughing in the grille surround. I'm still unhappy with the look of the front end, slope wise, so I'm going to try a couple more things tonight after I finish up around the windows. This continues to amaze. Great work! I'm looking forward to the next installment. Thank you so much! I think we've gotten as far as we can with simple sanding tricks and I'll admit, it looks better than I thought it would. 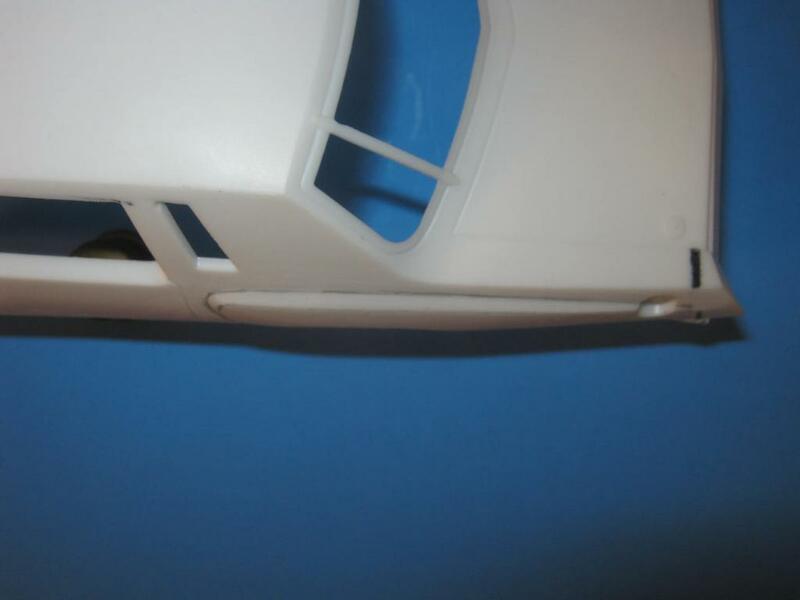 But what say we tune it in a little finer, and add some details with some easy for all plastic work? EDIT: I was wrong! We still have the greenhouse and rear end to go. Looking forward to that. The rear of the greenhouse looks bulky to me, as if a landau roof was smoothed over with putty, rather than subtracting it down to the sheet metal. Well I'll tell you, I know it looks as though I've spent hours on end with this thing in my hands. But really it's just been a few minutes here and there. I can see why you'd think that about the roof but I assure you there is no sign of this taking place. 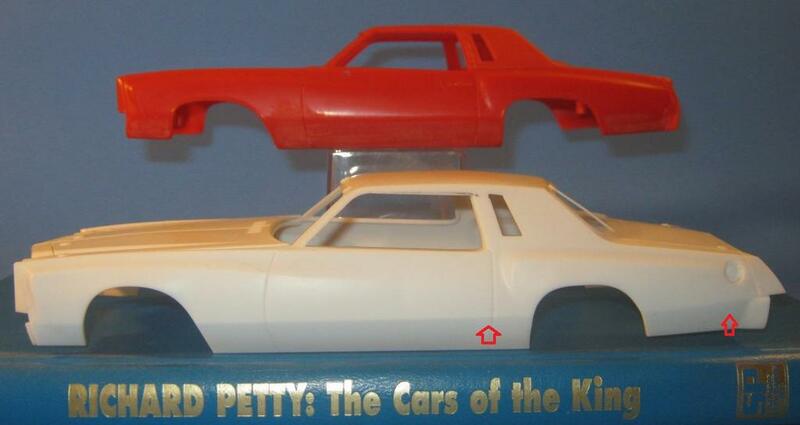 Oddly enough at one point, I considered swapping that portion of the cars and using the Revell... still might. Okay, I've actually already worked in the side window. 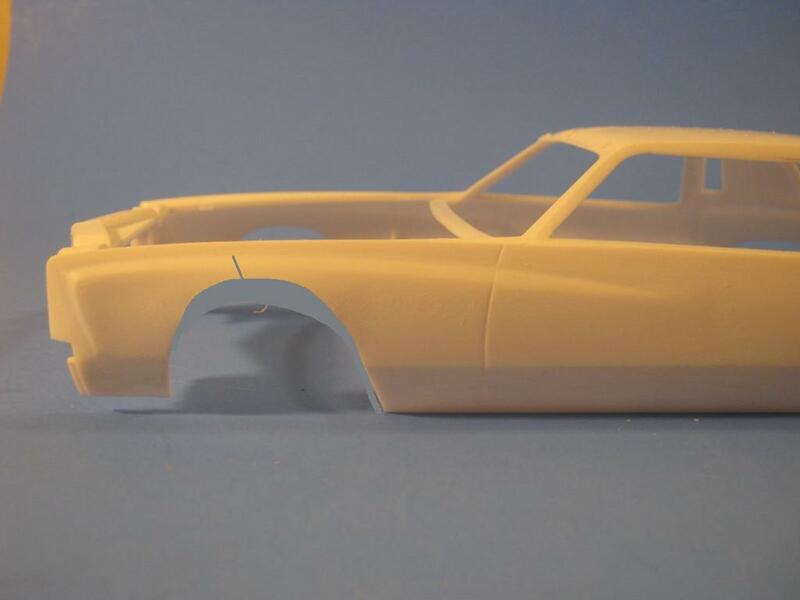 I'm working on a plan now for the windshield and tail light pods. To paraphrase Obi-Wan, this IS the post we're looking for. To pile on with a sanding pun... "Use the coarse Luke, use the coarse..."
The solutions shown on this thread are influencing me to purchase this kit. And honestly, you don't even have to get that greasy. All told, I've probably spent a whole two hours shaping this thing out, total time. For someone whose never tried something like this? Maybe 4 hours. Hard maybe. I'll be back later with the final leg of the quick fix and I'm chomping at the bit to get to the next level. 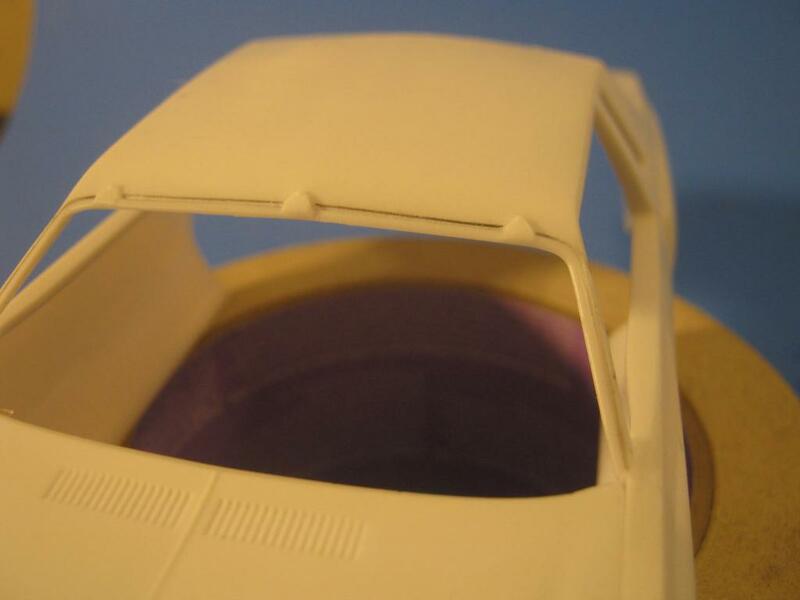 I don't know if it comes through well enough for you, but one last shot of the headlight area, where I rounded off the flat spot atop the hood, to blend it in better with the new headlight area. Normally I would leave a ghost image of the original hood pin or pre-drill a hole BEFORE sanding off a hood pin for locating the new one later but, eh, we're all trying new things right? I hate this, I really do. 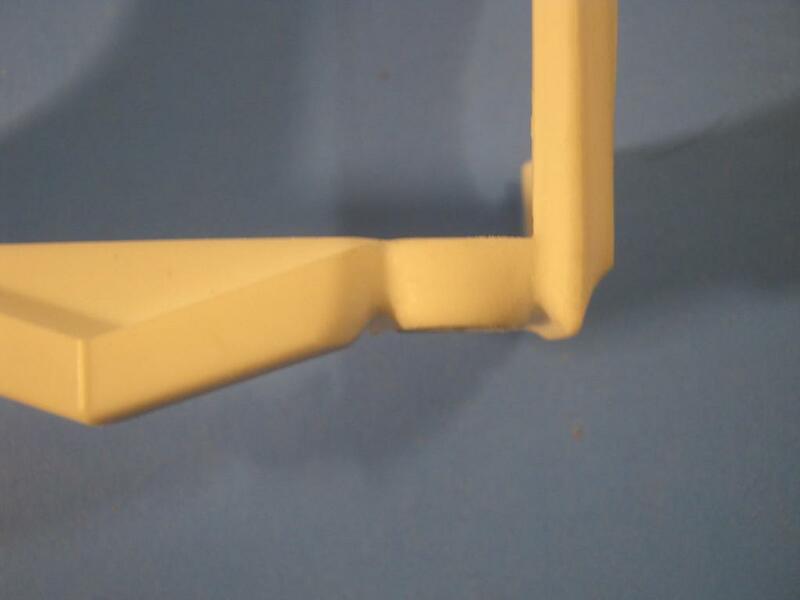 Once sanding of the door frame is done and the window post is straightened up to the trim, you have very little plastic left to work with. These cars had windshield trim roughly the same width as the A pillar. Once you've straightened the door window up there's little left to work with, although the A pillar will now be closer to what it should be. 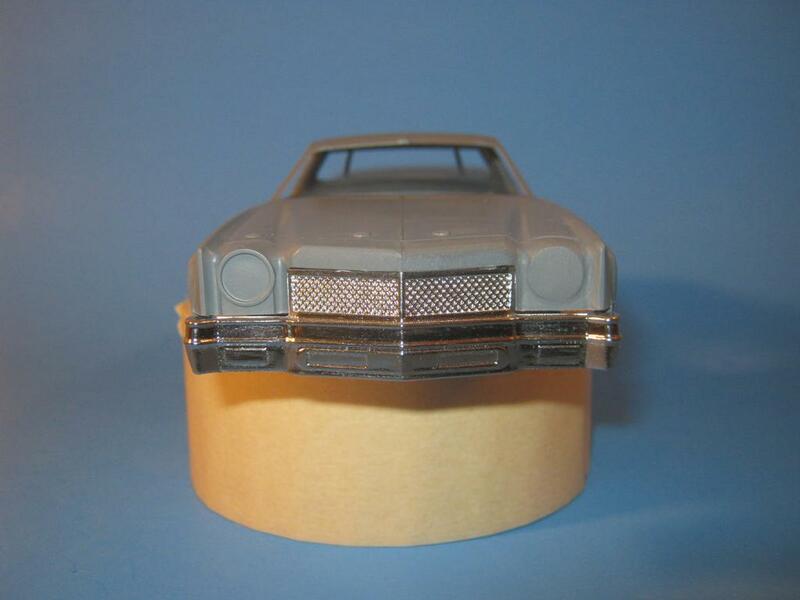 My suggestion here is: Using your emery board gently sand down the trim edges across the top of the windshield. What you're going for is dropping the height of the trim at the roof edge, while avoiding the trim's edge at the glass. 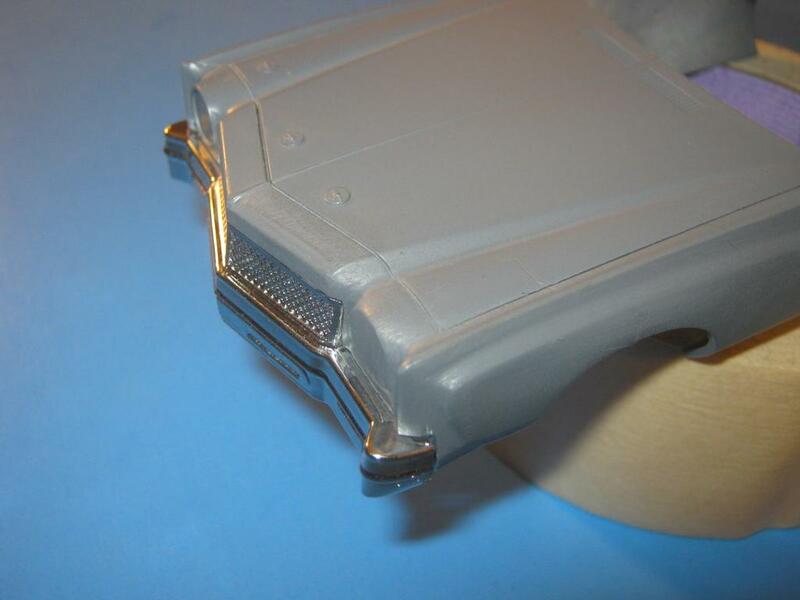 Once you have even, level trim all the way around, sand down the speed clips until there's just a slight edge to them. If you're happy at this point with your trim, proceed as you normally do. 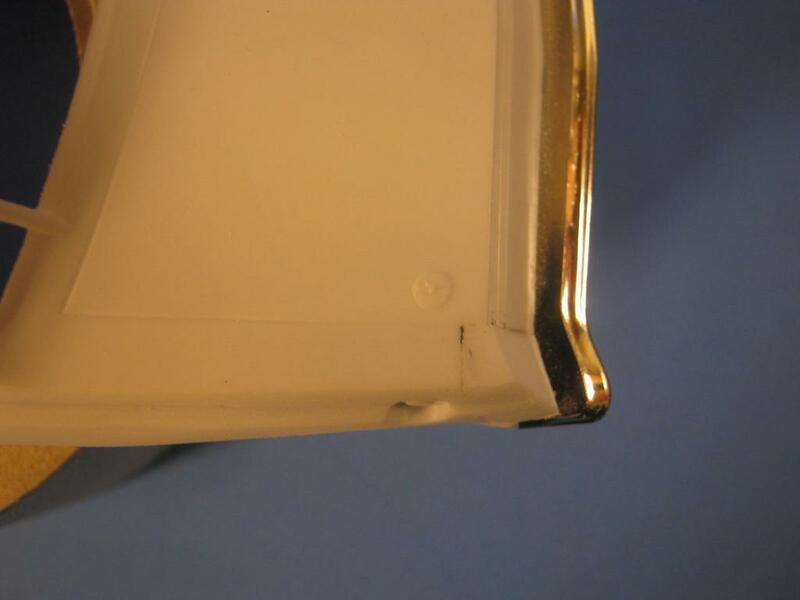 If your trim is still faint, I suggest using chrome craft tape. The craft tape is thick and the curve has to be hand cut, but you can cut out trim until you're happy with it. In place, it should now be almost level with the speed clips. Now foil over everything so it all matches. I would also mount the chrome tape with gorilla glue. Super easy! Cut a strip of masking tape about 1mm wide and line it along the side of the roof edge and A pillar at the extreme top and sand to it. You can now move the opera window up at the top and back or forward by sanding the sides. FINAL TURN This finish is a doozy that surprised even me! Note the difference, driver's side to passenger? This came out really well if I do say so myself. By the way, for some reason there's a bump on the right side of the bumper you'll want to remove. Whew! I need a minute to collect... my final thoughts. I have actually enjoyed this. And for this leg of the journey I'd like to pass on a few final thoughts. When I pulled this car fresh from the box life went on around me just as it does day in and day out. 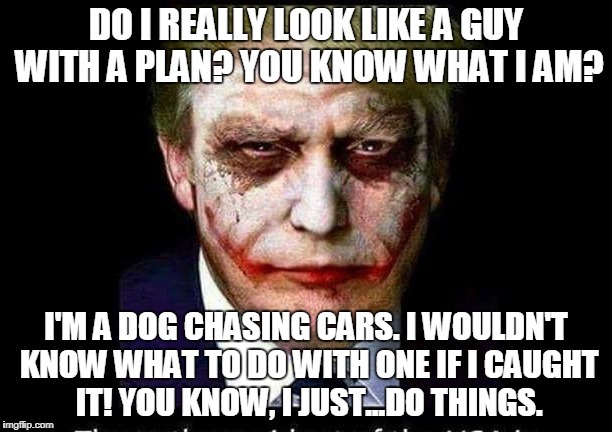 Because that's just what life does, like it is it's "thing" or something. Then I sat here compiling research and fiddling with my alabaster porpoise (!) and the more I did the more heated I got. All it took was for Abby to come home and ask me "So how is the new kit?" I cleared the room. I redlined all over everyone but I can't say it was entirely the kit's fault. But one should never judge a book by it's cover. For a start a book has a spine. And so does this car. (Seriously, there's a mysterious ridge down the middle of the roof!) Now a spine, as I'm gathered to understand is, The central structure of support bones. (Very important to have!) This car has a central structure, you just have to dig down to it. While an ugly duckling on the surface, some care and patience can actually bring out a... well it's a... not quite a swannnnn?? A Heron maybe? I mean, not as beautiful as a swan COULD be but... getting there. For serious! Whatever I attacked this with, sandpaper, file, sanding sponge, emery board, it took all in stride and as I said before took a few minutes on each thing I did. It does NOT want to scribe!! I tried every method and even thought if I "break the skin" with a blade, I could get a scribe going on those windshield pieces. NO WAY- Don't do it. It's like trying to scribe high pressure PVC. 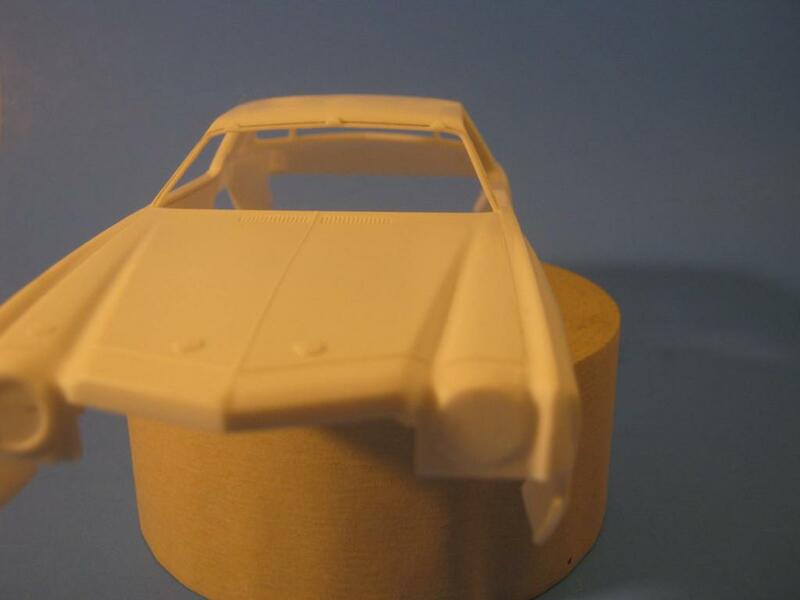 The roof does taper, and so does the Revell. The difference front to back is 1mm. It looks MUCH better after "cleaning" opera window area with an emery board. I went side to side on the roof to get rid of the spine and gentle circles with a 3M medium sanding sponge to blend. I didn't see any reason to mess with the back window area. The trim might not be entirely correct but, as bad as the front is, the rear window is straight and evenly leveled all the way around. But I'm getting ahead of me. 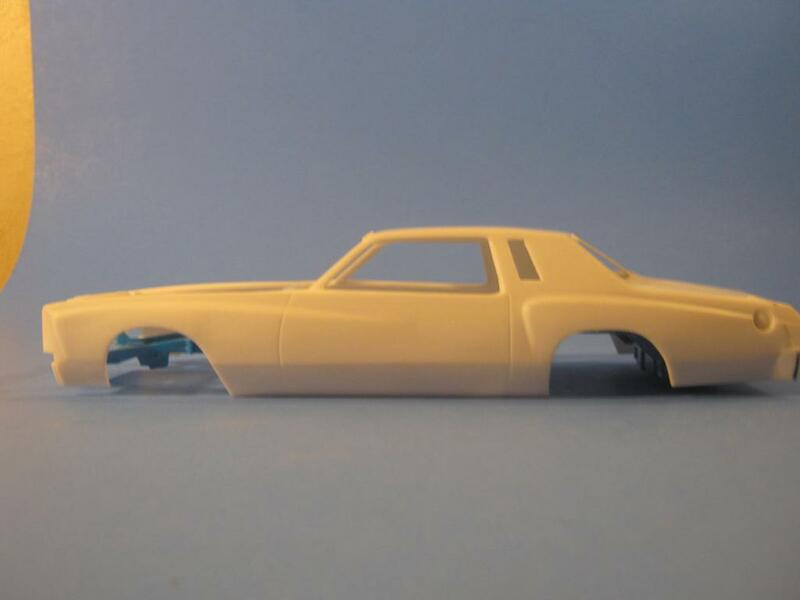 We started with the beltline down the side, lowering the rear of it to level with the rocker panels. This is neither right or wrong. Further research showed this is a part that again, was different for each team. 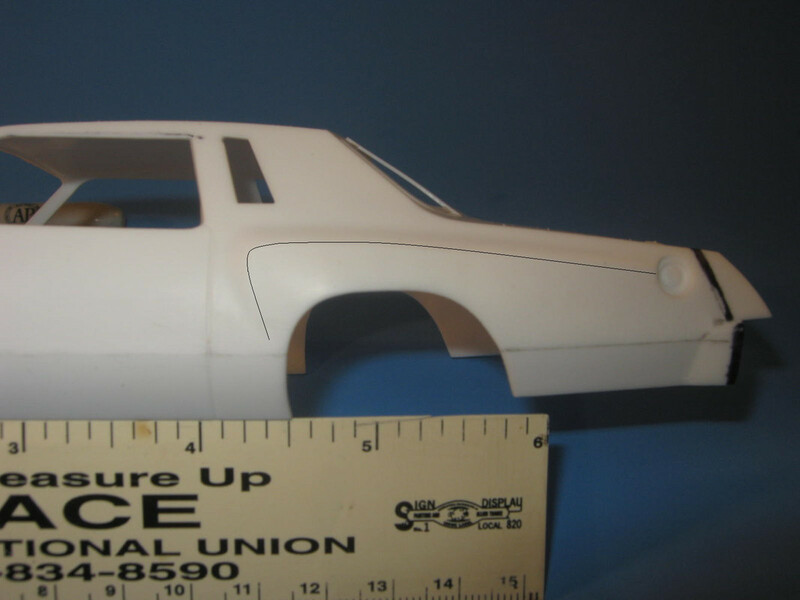 So depending on whether you're building a Darrel or a Cale, might dictate if that line needs sanded to a gentler roll, or removed entirely. 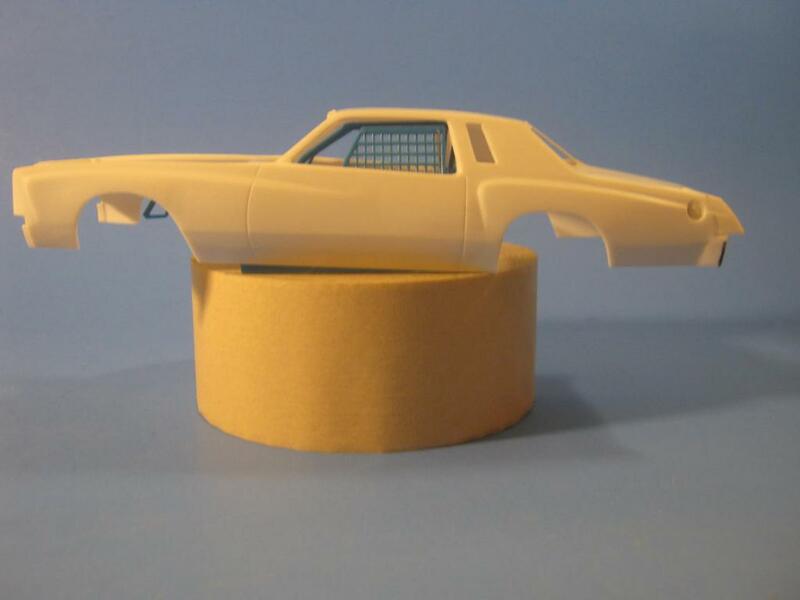 Next we moved the skirt sweep on the rear of the quarter panel down. In relation to the bumper skirts it was too high and was the one part of the car that was actually a little TOO swoopy. Don't neglect the belt line on the front fender either. These were different T to T.
We used an emery board on the lower body side to help us keep things straight, then we used it to dig down and back, to lower and lengthen the body bulge's crease to the tail. I lowered the crease almost midway through the fuel filler and it could stand to go lower, but there isn't enough plastic to back it up. Same with the swoop on the front fender. It's actually about 3 scale inches or mm, too far forward. It could also use some more upward sweep over the wheels and some "downforce" on the nose. Speaking of the nose, the face lift (literally!) was a bit intense. 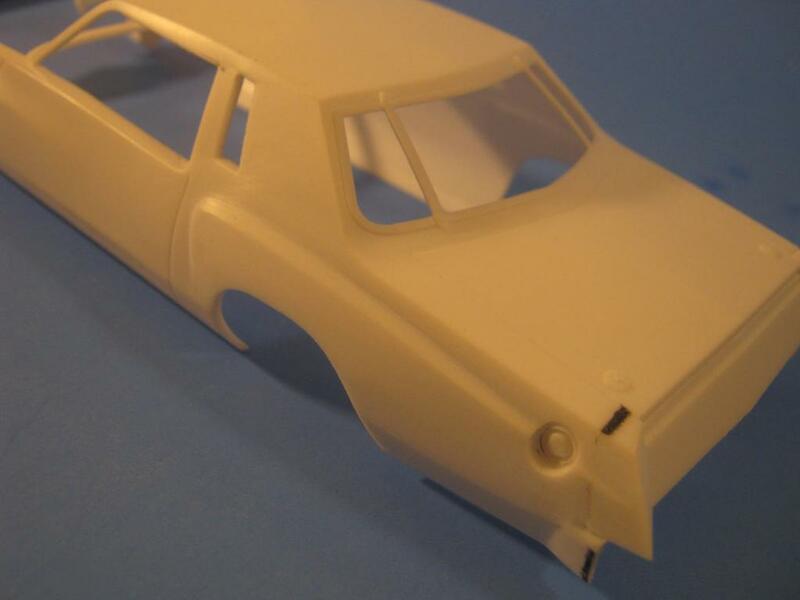 The simple parts are: Rounding in the headlight top and hood with 3M sanding sponge, and raising the grille opening 1.5mm. We also raised the panel under the headlight and the "turn signal" bottom, to meet the new specs. This was all done with jeweler's files and emery boards. You're going to want a small rat tail and an oval file to clean up between the light and fender and grille surround. Then finally, bringing up the rear (Oh what?! Like one of you wasn't going to try and work it in!) is the tail light. Ugh! I mean, that size and angle would likely look the berries on a custom or lowrider, but on this car they are cause for jeer! Here's the best part though: Again it's only about a mm, mm and a half you have to sand away. The biggest worry is getting it flat, while keeping the angle. Trust me on this, sand off the corner first until you're almost to your line. Then you can lay your board flat over the back and the "light" easily levels out without ever disturbing the inside portion next to the trunk panel. Thought primer might help. Nope... I still take crappy pictures!